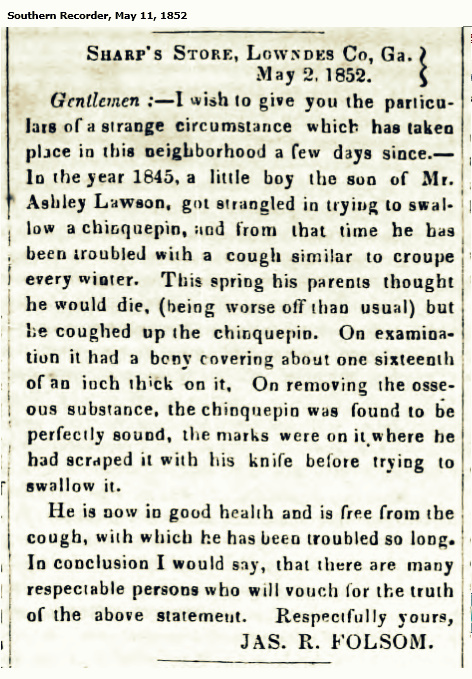 In 1852, a strange medical story from Sharpe’s Store, GA was circulated in state newspapers. Sharpes’ Store was at a center of commerce located on the Coffee Road about two miles above the present day town of Morven, GA. The store had been founded in 1826 when Hamilton W. Sharpe came down the Coffee Road and decided to settle near the home and traveler’s inn of Sion Hall in Lowndes County. Sharpe built a small store building out of logs near Sion Hall’s place. Thus, Hall’s Inn and Sharpe’s Store were situated approximately 25 miles southwest of present day Ray City, GA, the site where the Knight family first settled in the winter of 1826. In 1828, Hamilton W. Sharpe obtained the establishment of a U. S. Post Office at his store, for which he was appointed Postmaster. The Sharpe’s Store Post Office served Wiregrass Pioneers for almost 25 years. The medical mystery in 1852 concerned a son of Berrien County resident Ashley Lawson, who resided in the area of Troupville, GA and who was a veteran of the 1836 Battle of Brushy Creek. The story was reported by James R. Folsom, who was a teacher in Berrien County, and later, Postmaster at Cecil, GA.
Sharp’s Store, Lowndes Co, Ga.
Gentlemen: – I wish to give you the particulars of a strange circumstance which has taken place in this neighborhood a few days since.- In the year 1845, a little boy the son of Mr. Ashley Lawson, got strangled in trying to swallow a chinquepin, and from that time he has been troubled with a cough similar to croupe every winter. This spring his parents thought he would die, (being worse off than ususal) but he coughed up the chinquepin. On examination it had a bony covering about one sixteenth of an inch thick on it. On removing the osseous substance, the chinquepin was found to be perfectly sound, the marks were on it where he had scraped it with his knife before trying to swallow it.